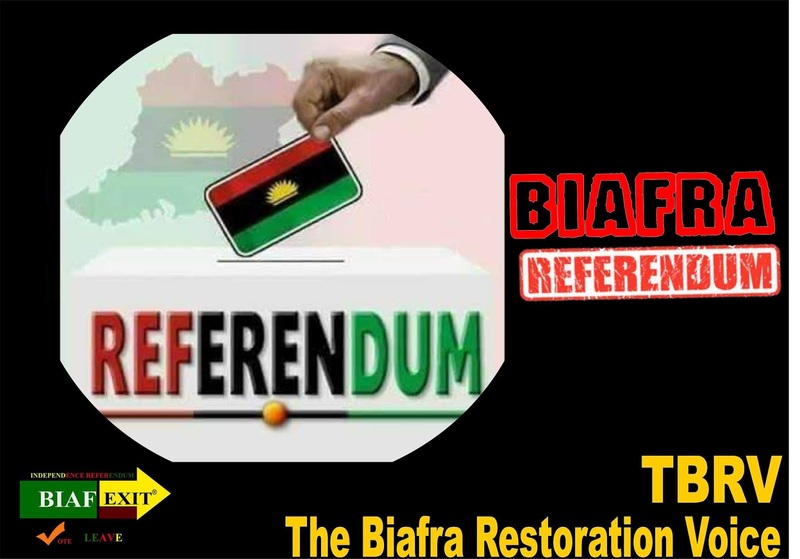 A golden opportunity has been presented on the platter to Biafrans to freely conduct her Referendum. February 16th 2016, a day set aside by the oppressive government of Nigeria to conduct her presidential election coincided with our referendum date. While the Zoo Nation will be busy voting, we the Biafrans will be busy carrying out our own legitimate Plebiscite by sitting down in our houses, boycotting the Nigerian election in Biafraland. The significance of this approach is that the same foreign observers jetting in for Nigeria election are equally taking every bit of note of our compliance to the boycott which they are fully aware of and duty bound to record and relay to EU, UN, AU, ECOWAS and other World bodies and Communities. Should we in like manner of the past boycotting exercises, when we recorded total compliance and Adhere strictly to this call, we would have ended this unworkable marriage with Hausa Fulani Caliphate without their knowing it. Just sit at home on February 16th and see Nigeria totally crumbling to her clay feet. Evidently, our decades of agony in the hands of the successive government in Nigeria has been divinely answered by the rare gift of God, in person of Mazi Nnamdi Kanu, who has sacrificially assumed a Messianic status in our match to freedom and collective destiny. Our forefathers had complained, cried for government developmental presence in our communities to no avail. He is blessed with the essential qualities of a leader which are, humility, truthful, trustworthy, fearless, eloquent, perseverance, wisdom and intelligence! Now that God has graciously and divinely given us this opportunity which promises to be bloodless for our referendum, let us fully make use of it by staying indoors with the members of our family, not coming out to vote or engage in any matter related to Nigerian poll. In addition, by so doing, the stray or targeted bullets of trigger-happy Nigerian security operatives who have as usual been detailed by Nigeria government kill us will not meet us as a victim. Those who thought Biafra referendum will be impossible will see with their necked eyes how it works. Let's dutifully play our part excellently and see Biafra come. Do not be deterred by any situation, be brave and courageous in asserting your sacred rights. History will surely record our individual and collective efforts and sacrifices in this struggle for Biafra Freedom. Remember, Civil Disobedience is legitimate in a struggle for self-determination in accordance with the UN Charters. Capitalise fully on this golden opportunity come February 16th but play safe by staying in your house.